The feature for defining different eye points based on the zeroing setting is a very nice feature, BUT there is a serious error with it. The result of this error is that it is basically impossible to set up properly aligned sights, that work and look correct, unless you spend an unjustifiably huge amount of time to trial and error every single zeroing position and apropriate sight animation to match. 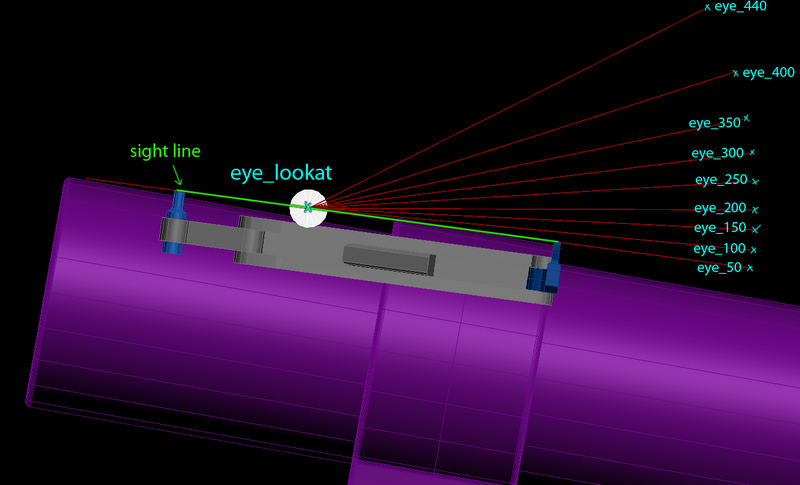 The error is that there is a position / translation offset ,which increases with increasing view angle in relation to the sight unit (defined by the eye points). The angle itself matches the defined one well, but the camera offset breaks the system. In this picture the center of the screen is the little white dot (marked by pink arrow on the most left picture in the series). Notice how the sight, in relation to the center of the screen moves when changing the zeroing setting. The cyan part is the rear sight piece, the orange piece is the front sight piece. They are never aligned properly due to the offset. The other little boxes are just to confirm that the animation of the sight is working exactly as i defined (and matched with the multiple eye points). Re-check code and implementation for potential errors and ensure that the cameraDir point will always end up in the center of the screen. Define discrete cameraDir points to each discreteDistanceCameraPoint has a matching counterpart, and where every cameraDir point will guarantee that it is at the center of the screen. e.g. use vanilla rifle with grenadelauncher, select grenadelauncher, notice how the sight point moves up/down (in relation to the center of your screen) when changing zeroing position. It shouldn't. Only the elevation angle of the view should change.